The first thing you need to do after starting a WordPress Website is to add your WordPress site to Google Search Console ( “previously known as Google Webmaster tools” ). Google Search Console is a free tool offered by Google for Webmasters that lets you understand your website performance and behavior. It is also a handy tool for SEO point of view i.e you can implement some changes on your website by looking at the different information shown inside the tool. It allows webmasters optimize and maintains their site’s presence in the search results. It provides detailed reports about your website such as indexing status, Crawl stats, and errors, keyword position, security issues, etc. Rare Google Webmaster Tips for Rank higher: This isn’t really related to this post, but it is an important SEO technique that most of the SEO experts don’t share with their users. Well in your webmaster tool, you can find out the search terms your website in ranking on google. To rank those keywords higher, add some content using those keywords in your webpage. Also, interlink those pages that are ranking higher in search results. Do these tweaks on 3-4 pages and see the performance after 1 week. You’ll surely find the improvement in the rankings of those keywords in search results. Adding your Website URL to Google Search Console is the first step towards SEO. In this blog post, I will teach you how to add and then verify your website ownership. Sign in to Google Webmaster Tools using your Google account. You can use your Gmail account to login or else create a new google account. Click on “ADD A PROPERTY” button, enter your website URL and then click Add. On the next screen, Google will ask you to verify the website’s ownership. If you Website URL or domain name is example.com, then write like http://example.com/ or https://example.com/ if you have SSL enabled domain. The next step you need to perform is to verify the ownership of your website in google search console. There are several methods to verify the WordPress site. I have discussed some of them below. Use any one of the methods for verification. This is the recommended method to verify WordPress site with Google. You need to upload an HTML file to the WordPress root directory using Cpanel File Manager. You can also use an FTP to transfer files to WordPress server. Select HTML file upload option, and download the HTML verification file. Login to your Cpanel account and go to Files > File Manager > public_html. Now, upload the downloaded HTML files inside the public_html directory. Go back to the google search console and click on the VERIFY button. Select the HTML tag option and copy the meta tag code. Head over to your WordPress Dashboard. Navigate to Appearance > Editor > header.php. Paste the copied meta tag just below the <head> tag and save the changes. Go back to google webmaster tools and click on the VERIFY button. NOTE: If you change your WordPress theme, you have to paste the meta verification code again in the header.php file. You will find the verification code in your search console account using the HTML tag option. Just copy the code written inside the content attribute. See below for reference. 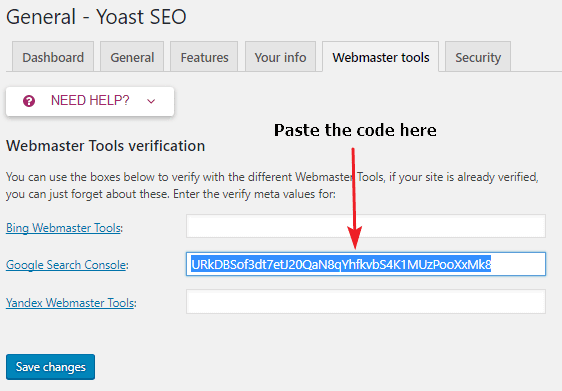 Download and Activate the Yoast SEO Plugin. On your WordPress admin dashboard, navigate to SEO > Dashboard. Under Webmaster tools, add the verification code in the Google Search Console field. Click Save changes. Go back to the webmaster tool and click on the VERIFY button. That’s it for this WordPress tutorial. Use any of the above verification methods to add your site to Google Webmaster tools. Once you have done the verification, you need to generate an XML sitemap for WordPress. If you encounter any problem while adding WordPress site to google search console, feel free to comment down below. You will get an immediate response. Please share this article with your friends.